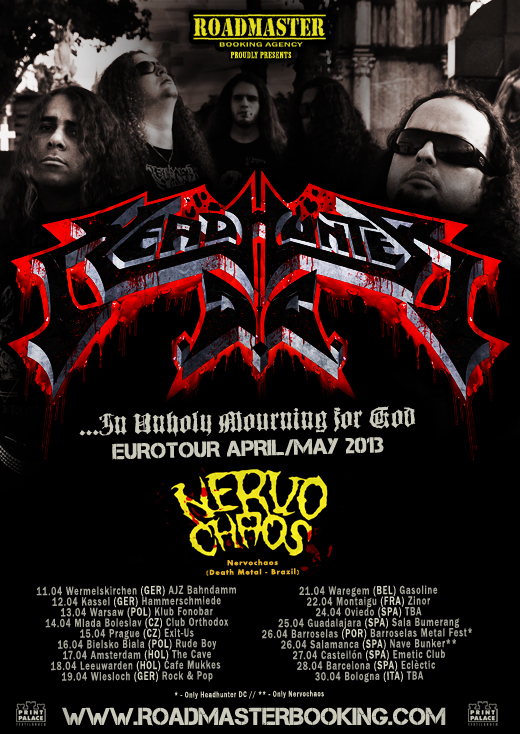 It is with immense pleasure that Roadmaster Booking comes to announce the dates of the European tour of HEADHUNTER DC. The tour has shows scheduled in Germany, Poland, CzechRepublic, the Netherlands, Belgium, France, Spain, Portugal and Italy. Together on the road will be the Brazilian Death Metal Band NERVOCHAOS, which will return to Europe to promote their latest album “To the Death”. The Croatian Band WAR-HEAD had his participation cancelled, due to an accident with the guitarist Vladimir Sužnjević that rendered him unable to play guitar on this tour.